This guidance has been prepared specifically for researchers in receipt of funding from the NIHR Programme Grants for Applied Research (PGfAR) Programme. Please ensure that you follow this guidance in addition to the rest of the Information for Authors guide. After the successful completion of a pilot phase to evaluate a different report structure for PGfAR Journals Library Reports, the NIHR Journals Library Board agreed a change to the submission requirement for PGfAR reports. From January 2017, all researchers funded by the PGfAR programme should submit a final report using the summary report guidance as below. The preparation of a final report for these complex and extensive programmes of research should not be underestimated. The report should be a considered, well-prepared account. It is acknowledged that researchers involved in work funded by this programme are actively encouraged to publish findings and developments over the course of their research. The PGfAR summary report requirement has been designed to recognise and utilise these published articles to support the account of the research you submit to the NIHR Journals Library. Approximately three to six months before you submit your report, your PGfAR programme manager from the NIHR Central Commissioning Facility (CCF) will send you an email advising you of the submission date for your final report and providing further information about the documents you will need to submit with your report. At this time, you will also be invited to suggest potential reviewers for consideration. In order to avoid conflicts for reviewers, authors should also provide information about membership of any advisory groups or programme associated committees such as Trial Steering or Data Management committees where appropriate. Authors should also regularly update their PGfAR programme manager contact on the date they plan to submit their final report so that they, in turn, can inform the Journals Library team for them to reallocate resources. PGfAR authors should refer to this guidance when preparing their draft final report. The summary style report format is detailed below. Where reference is made to ‘Standard’, authors should refer to the relevant part of the 'Information for Authors' guidance on the Journals Library web pages. Please also provide a research summary that records any changes from the original proposal that have affected the direction of your research programme. This summary will help the Journals Library team prepare editors and peer reviewers for the changes and developments since the start or your research as planned in your funded application. The total word count for the synopsis/summary may vary depending on your research but the recommendation is it should be a maximum of 25,000 words. This is a guideline only but where reports are submitted in excess of 30,000 words, authors will be asked to reduce the report word count. This section of the report forms its core. As such, it should provide an accessible synthesis of the entire programme showing clearly how each element relates to and, where appropriate, builds on another. We would like this part of the report to “tell the story” of the work undertaken as a result of the programme grant – its development, successes, challenges, recommendations for future research and conclusions. 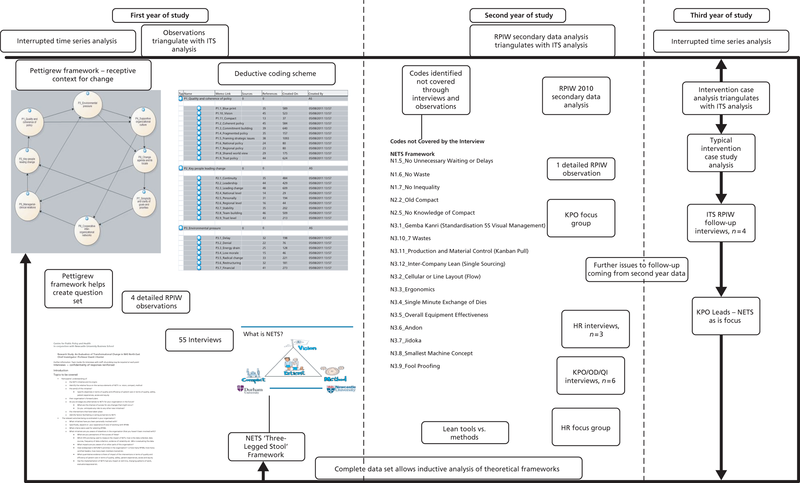 As part of this section, you will need to provide a Research Pathway Diagram of the stages and development of the interconnecting work packages that contribute to the whole programme. You can find examples in the published PGfAR summary reports in the NIHR Journals Library. A good example of the type of suggested diagram can be found here: https://www.journalslibrary.nihr.ac.uk/publications/hsdr02470/08-1809-255-fig2.png. Any alterations to the programme's original aims/design should be summarised briefly. We recommend that within this summary, authors provide a short sub-section for each work package, briefly summarising their research aims, methods for data collection and analysis, any limitations, key findings, and the interrelation with other parts of the Programme. More detailed information (e.g. protocols, tools, details of interventions, consent processes, figures, tables, published papers or links to them) should be presented as appendices rather than breaking the flow of the text in the main body of the report. It is appropriate to provide a web-link to these resources as your appendix. Authors should include an account/discussion of the involvement of patients and/or the public. We anticipate that authors will draw the synopsis to a close by reflecting on what was and what was not successful in their programme before including a sub-section where they make their recommendations for future research, and a sub-section drawing out implications for practice and any lessons learned. The appendices will be a substantial part of your report containing a full description of methods, tools and outcomes where research has not been previously published. Particular reference to use of tools, methods and details of interventions would be included in these appendices. Written appendices should be concise. * If you have placed a proof copy of your article in your institution’s repository and the document is available as an open access item, you may wish to use this as your link if the published article is only available through journal subscription or pay per view. ** Please note that it is now possible to include links to outputs such as published articles in your project pages of the NIHR Journals Library. This will allow you to consider carefully which of your published articles are best suited to the final report and which could be accessed as links from your project pages. Please refer to your PGfAR programme manager for more information. You should submit your draft report and accompanying documentation as requested by your PGfAR contact not (as described in the main author guidance) via the NETSCC MIS system. Once they are satisfied that your report can go forward for editorial review, a member of the NIHR Journals Library team will check the submission and notify the editors that they have received the report. After this, the NIHR Journals Library team will be your main point of contact through the stages of review and revision and will advise on how you should submit revisions and additional documentation. Ultimately, your PGfAR report should bring together all of the strands of the programme in a single place, such that the report as a whole is greater than the sum of the individual parts. It will also act as an archive for the whole Programme Grant. "This project was funded by the NIHR Programme Grants for Applied Research and will be published in full in Programme Grants for Applied Research; Vol. X, No. X. See the NIHR Journals Library PGfAR project pages for further information." The editorial review process for the PGfAR report submissions differs in one way from the standard process. Because of the scope and diversity of the PGfAR research programme, reviewers will only be approached to review the report after the report is submitted. Editors are assigned once the report has been checked by one of the Journals Library team. The editors will review the report and may ask for early revision prior to peer review. Once the editors consider the report ready for peer review, they discuss the relevant types of reviewers with the NIHR Journals Library team in order to secure the most appropriate ones for the subject matter. This will add a minimum of 2-4 weeks to the editorial review process.